Lola Zola authors, Marcy Winograd and Jackie Hirtz will be on “Authors Talk Live” on Sunday, February 8, 2015 from 12:25 to 12:50 pm PST. They’ll be interviewed by show host Patricia Johnson, along with Victoria Christopher Murray, prolific author and co-founder of Brown Girls Publishing. Authors Talk Live will also feature Brown Girls Publishing authors Candy Jackson and Gregory Marshall beginning at 11:00 am PST (Authors Talk Live is from 11:00 am – 1:00 pm PST each Sunday). You can listen here: WPBRadio.com Enjoy! Get a Kindle edition of Lola Zola and the Lemonade Crush for free on Amazon! Monday March 25, Tuesday March 26, and Wednesday March 27 you can get Lola Zola and the Lemonade Crush here for $0. !!! Melanie Papadakis got her free book, so did Lola, Buck, and Hot Dog Hernandez. will feature Marcy Winograd and Jackie Hirtz and Lola Zola and the Lemonade Crush! Readers, writers and friends of Lola Zola are invited to listen to the authors speak, talk with students about writing, and watch a live Readers Theater performance starring students, faculty, and parents. What fun! The annual literary night, sponsored by the PTA, is a favorite school event every year. There will be lemonade of course, cookies and treats for sale, books to peruse and purchase, and READ dogs to meet and greet. More information will be posted here soon… Meanwhile, save the date and stay tuned! Have fun this Saturday at the Kate Kate Tween/Fair in Rustic Canyon. Be sure to say hello to authors Marcy Winograd and Jackie Hirtz and check out Lola Zola and the Lemonade Crush. Rustic Canyon Park is located @ 601 Latimer Road, Santa Monica, Ca 90402. The event is from 11-4. 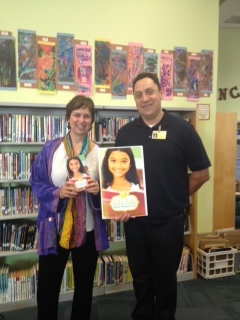 Authors Marcy Winograd and Jackie Hirtz visited John Muir Elementary School in Santa Monica on Monday November 20. Three sessions in the amazing school library were held for third, fourth, and fifth graders. Many thanks to school librarian Diane Greenseid for hosting the authors. Joe Ramirez, third grade teacher, set up the visit — thank you Mr. Ramirez. Young teens, tweens, families and book lovers are invited to hear authors Marcy Winograd and Jackie Hirtz read passages from LOLA ZOLA and the LEMONADE CRUSH, their new tween novel. Marcy is a resident of Ocean Park and the Secretary of the Ocean Park Association. Marcy and Jackie will also encourage young teens to read passages of Lola Zola in a Readers Theater presentation. Budding actors can practice their drama skills. Lola Zola is an indomitable sixth-grader who tries to support her laid-off parents by selling lemonade rumored to be a fountain-of-youth elixir.